Southern California Shiba Inu Rescue Inc.
Anyways, anybody in Cali know of people doing Kai rescue in that area? he's cute! I love his socks, too... :) I hope hes a super nice dog. The food guarding could be managed with crate feeding/owner education. I'm agreeing with Calia. I thought JA instead of Kai at first glance. So JA mix. His face is totally Shiba. I'd know that goofy Shiba grin anywhere. Ok, it's fun to guess! Is there a JA rescue in California? I'm surprised that the shiba rescue doesn't just take him and show him off, being that he's suspected to be part shiba. That brindling will definitely make him stand out against the common red, black/tan, and cream shibas, so he should be able to find a home quickly. Wow, he is super cute! love love love the distinct coloring. I agree though... you don't replace an existing dog because you got a puppy!!! Where is the loyalty indeed? I hope he finds a great home, he has a great face. Cute, cute boy. I'm actually in love with this dog :) I was contemplating on contacting Miisan kennels to be put on a waiting list for a silver/blue JA but I don't think my girlfriend likes big dogs. Possibly going to see Katja for a Shika, depending on my internship schedule. The face looks like a Shiba but the brindle looks like it's an Akita. Very, very cute. Now if there is a way to get it to Florida, I'll be more than happy taking the dog in, at least foster it. @Zinja - I am sure with the Shiba rescue networking, there might be a way to get the dog to you. @Lindsayt - Would you list the rescue organization that is asking about this pup if you think they might be willing to help set up transport? Southern California Shiba Rescue. I posted their info under the pictures. Since he isn't a purebred, the breed rescues are unlikely to fund an airplane ticket. Someone would have to really want him enough to pay for that themselves. This pic has been going around some of the Kai lists. I look at that dogs and see absolutely no Kai Ken in him. Anyways, I hope he finds a home. He is very cute! @lindsayt Yeah I saw this dog on the Kai list. I don't think he looks like a Kai at all. There's Red at the No. Ca. Shiba Inu Rescue. He takes Shiba Mixes and even Jindo/Jindo mixes. He's super cute! He looks like a Shiba mix to me, and yeah, maybe JA in there? For sure an NK mix. You know, Red at the NoCal rescue has been super helpful--he'd probably be a good bet to at least know what to try with this guy. And yeah, a pox upon the owners who are getting rid of a dog because of a new puppy. Doesn't bode well for the puppy, does it. Yep, I agree, he doesn't look kai at all. Most likely a JA or shiba mix. He looks great to me! 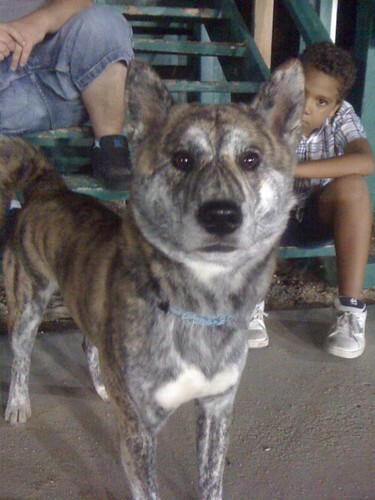 A shiba with brindle akita markings would be so cool. @Zinja you should totally adopt him! We can whip up some of that NKF magic and get him transported, right guys? If not, shipping him really wouldn't cost that much when you consider how much a puppy usually costs. Since when do breed rescues only care about purebreds and not help mixes? 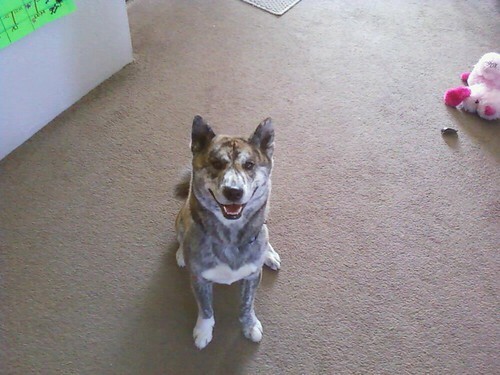 I see so many dogs that don't even look remotely like Akitas labeled as Akita mixes and pulled by A Passion For Paws. The same is true of the GSD, Great Pyrenees, and Labrador rescues I used to pay attention to. That's true....maybe we could get him to Florida! he's super cute--such a typical Shiba expression in all that brindle! We pulled "shiba" mixes all the time that have no shiba in them. Unfortunately we are clear in Ohio and the kennel facility we use is full. That's sad if pure breed rescues are being like that.. I mean a lab mix is still worth rescuing they have some lab in it.. I don't keep tabs on much rescues so far usually just see shiba in midwest shiba rescue only thing I note is haven't seen a rescue from Indiana on it.. There is a shiba and basenji rescue in Indiana and they have shiba, basenji and mixs of shiba and basenji.. I will share this link w/ the two Southern CA Shiba Meetup organizers. Maybe they can publicize this little guy among their meetup membership. @zinja-- if you want me to help you hold him and send him on a plane to you, I don't mind!! He looks like a Tora ge akita, so awesome! I'll try to ask if people want him! You're late to the party on this one @tarokun :P This thread is over a year old. :-(( God dang IT! I had like 5 five people interested! Does anyone know it this guy ever got a home?